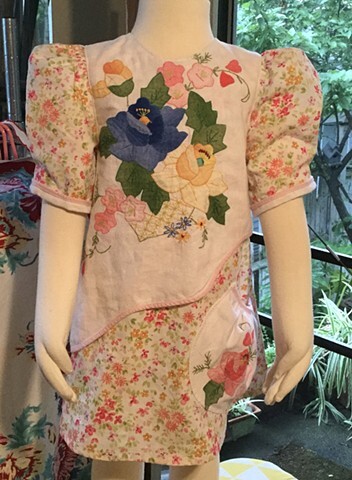 Created from a re-assigned vintage apron with flower appliqués, size K-1st Grade (age 5-6), measuring 24” across chest, 19” shoulder to hem, this dress is a floral delight. A-line, pull over the head with 3 button closures on the back, single large pocket, puff sleeves. $90, 100% cotton, made by the designer herself and shipped free to any address in the U.S.